Aloe Vera is That Good ....it's the Best! 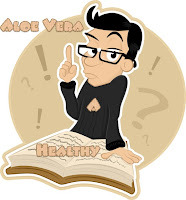 Even now, after years and years of scientific breakthroughs and landmarks the medical community as a whole, resist the inclination to believe that many of the mainstream conditions one reads about in the news media ...that all these conditions and more could be treated successfully and with dramatic results with one simple plant and/or by the active ingredient from that plant known as Aloe Vera. What continues to be resisted is the simple fact that not only is a properly stabilized organic Aloe Vera perhaps the most versatile, adaptable and compatible healer in the history of medicine ...which has without a doubt, time after time and in test after test proven to be the most broad spectrum antibacterial product ever tested. All this leads up to the question ...that, if a properly stabilized organic Aloe Vera is so versatile and so compatible to all the health conditions from A-Z ...then why hasn’t the mainstream media picked up on it and flooded the industry with all its positive results. Perhaps, no matter how versatile, adaptable and compatible as a healent ...no matter how dramatic the medical breakthroughs, no matter how much clinical data that favor it. Properly stabilized organic Aloe Vera will always be subject to the statement ...that nothing can be that good! However, that statement is true...properly stabilized organic "Aloe Vera is that good ...it's the best!" It has finally happened. Aloe Vera is in everything! It’s in many different soaps, shampoo, in hair conditioner, in shaving lather, in facial cremes, in body lotions, in toothpastes in liniments, in body powders and in cologne...and many other personal care products. The day has finally come when no longer is properly stabilized organic Aloe Vera the secret of the enlightened few. It is now becoming known to the masses. To some, this is good. To others, it may not be so good. First, we have to consider the matter of product efficacy and the quality of the Aloe Vera being used. Then, we have to be concerned with the matter of how much is real Aloe Vera and how much is watered down Aloe Vera. And then whether or not the Aloe Vera in question has been properly stabilized. This is important, because, what we’re dealing with here is the issue of credibility and the fact that Aloe Vera’s universal popularity and use in fun cosmetics may actually be harming its image as a serious healent and its potential worth as a breakthrough product into a new era of profound medical respectability. Let’s deal with the issue of properly stabilized organic Aloe Vera. In the first place, there are no inexpensive ways to process a full potency stabilized organic Aloe Vera. And at some point the cost will be passed on to the end line consumer. In other words, a top quality, high potency stabilized organic Aloe Vera will cost a little more and in some instance a lot more. And what’s important here is that your ability to determine the percentage of properly stabilized organic Aloe Vera in the products you purchase...can sometimes prove to be almost useless. That’s why when we talk about the therapeutic healing value of a properly stabilized organic Aloe Vera product...always search for the "Best Tasting Aloe" and ...always...always know your supplier!